PremiumSportsCenter: MANCHESTER UNITED SUFFERS TITLE BLOW AS EVERTON LAUNCHED COMEBACK IN AN AMAZING EIGHT - GOAL THRILLER . MANCHESTER UNITED SUFFERS TITLE BLOW AS EVERTON LAUNCHED COMEBACK IN AN AMAZING EIGHT - GOAL THRILLER . Manchester United dropped two points in the Premier league title race in an unbelievable 4-4 draw against Everton at Old Trafford. 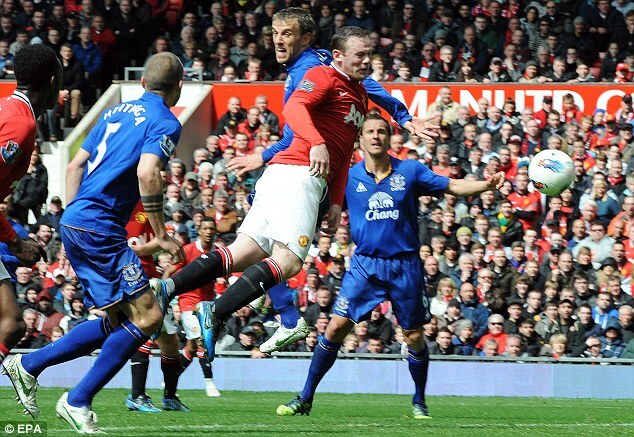 The Toffees took the lead through Nikica Jelavic and Wayne Rooney equalised before the break. But in the second half, six goals spilt equally ensured that United left the ground disappointed, having led 4-2 with seven minutes to play. There was only one change from United's team who beat Aston Villa 4-0 last week, with Ashley Young replaced in the starting lineup by Nani following a week of controversy over the award of a penalty kick in the opening stages of that match. For Everton, David Moyes made three changes to the side who lost out to Liverpool at Wembley, with Tony Hibbert and Phil Jagielka coming into the defence in place of Leighton Baines and Tim Cahill, with Sylvain Distin moving to left-back. Magaye Gueye was also replaced by Steven Pienaar. The visitors created the early opportunities of the game, the first with a header from Leon Osman that David de Gea saw comfortably wide. The Spanish keeper was then forced into more urgent action in the fifth minute as Nikica Jelavic got a sight of goal, springing the offside trap but seeing the shot saved low to his left. Nani had the first shots for the hosts, cutting in off the left flank to curl two efforts, one of which flew wide and Tim Howard comfortably saving the second. Paul Scholes had an effort in the 16th minute from distance, but Howard saw it wide before the visitors had a dangerous counterattack, but Rio Ferdinand did well to clear the danger. Everton were doing a good job of containing United's attacks in the opening half-hour and looking to spring some quick breaks of their own, with Marouane Fellaini holding the ball up well. Former United man Darron Gibson had a shot from distance soon after the half-hour mark, but again the goalkeeper went untested as it screwed wide. And in the 33rd minute the visitors took the lead. Hibbert put in a deep cross from the right wing, and Jelavic headed the ball perfectly over De Gea and into the far corner. 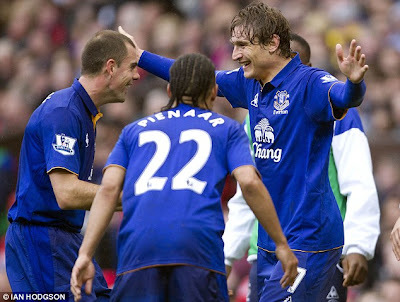 The keeper no chance, and Jelavic became the first player to score a league goal against the Spaniard since Jermain Defoe netted for Tottenham in United's 3-1 win on March 4. United were almost back in it straight away as Scholes hit another effort from the edge of the area, this one taking at least two deflections before Howard did well to block it. And in the 41st minute, the hosts were level. Nani whipped in a devilish ball from the left wing that just passed over the head of former United player Phil Neville, and Rooney nodded the ball home from six yards out past the helpless Howard. With that header, Rooney moved joint fourth in Manchester United's all-time goalscoring list, level with Dennis Violett and George Best on 179 goals for the club. In the last action of the first half, Sylvain Distin was rather harshly booked for bringing down Antonio Valencia as the winger looked to get through on the right wing. The defender appeared to use only his shoulder in a battle of strength. There was a break in play shortly after half-time as Osman and Patrice Evra clashed heads nastily in an aerial battle, but both players were fine to continue. And Everton quickly found themselves not only behind but two goals down thanks to some wonderful attacking play from the hosts. United took the lead in the 57th minute through slightly controversial circumstances. Pienaar had gone down with an injury to his midriff, but referee Mike Jones let play go on, contrary to a situation in the first half when Everton were on the attack and the play was brought back due to an injury for Jonny Evans. But as play significantly progressed, the ball fell to Nani, who found Welbeck on the edge of the area. The striker dummied a shot to make space for himself and curled a wonderful shot into the top corner. And four minutes later United extended their lead with a great team move. After some good passing involving Valencia and Carrick among others, the central midfielder found Welbeck in the box and the striker flicked the ball into the path of the on-rushing Nani, who took a touch before dinking the ball over Howard to extend their lead. 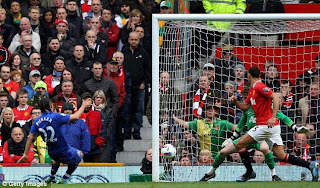 Everton were straight back in it though, as Fellaini volleyed home from another Hibbert cross in the 67th minute, with some very suspect marking on show from United's central pairing of Evans and Ferdinand. But two minutes later United extended their lead again with some great link-up play between their strikers. 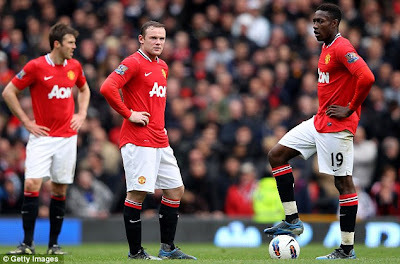 Valencia aimed a pass in towards Welbeck, and the striker stepped over the ball, bewildering Jonny Heitinga and beating him for pace as he let the ball roll to Rooney. The Liverpudlian played a pass in behind for his strike partner to latch onto, and the ball was then squared for Rooney to notch his 26th Premier League goal of the season, taking him one goal behind Robin van Persie in the race for the golden boot. Rooney is now only behind Denis Law, Bobby Charlton and Jack Rowley in United's all-time goal scoring record after scoring his 180th strike for United. But the game wasn't quite over. Evra almost made sure of the victory when his diving header hit the post, but Everton incredibly drew level with two goals in as many minutes. A ball hoisted into the area by Neville wasn't dealt with by Ferdinand and Evans, and it fell to Jelavic who volleyed past De Gea, with the keeper again standing no chance. And straight away Everton were on the attack, with Neville again finding Fellaini in the box, this time into feet. 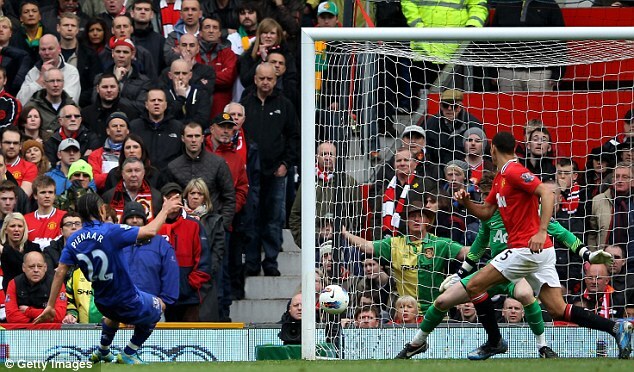 The Belgian managed to turn and find the unbelievably unmarked Pienaar at the front post to poke the ball past De Gea. Despite all of United's late efforts to find a winner, including a volley from Rio Ferdinand that was brilliantly saved by Howard, United dropped two points and handed Manchester City a brilliant boost in the title race.